Because Audi, Porsche and Volkswagen are our passion, it’s all we have ever done, and we do it really well. Oddly, our business has flourished even though we have no corporate mission statement framed alongside Dan’s portrait, hanging in a fancy boardroom. Silly us. We just base our business on the Golden Rule: we treat our customers the way we would want to be treated. 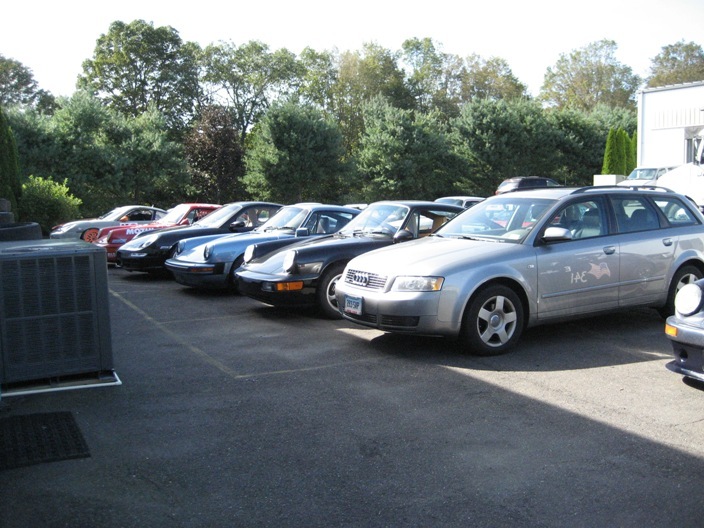 When you bring your street Audi, Porsche, Volkswagen or track Porsche to Hairy Dog Grrrage home of Daniel Jacobs LLC, you will be treated like a friend, and you will receive premium quality parts and service from certified Audi, Porsche and Volkswagen nuts who are the most experienced and skilled in the region. Matter of fact, you don’t even need to bring it to us. All you have to do is call and we’ll come get it, and bring it back home all set for you. It couldn’t be any easier. Hairy Dog Grrrage has a lot of friends. The majority started out as customers. They stop by, call or e-mail us regularly just to shoot the breeze with Dan or pick his brain (an invaluable resource by all accounts). You’re invited to join in and enjoy the rewards of a relationship with one of the most respected and talented independent Audi, Porsche and Volkswagen gurus in New England.